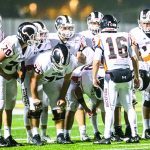 It may not have been the prettiest game of the year for Rockford but the Rams methodically eased their way to a 39-10 triumph over Grand Haven on a sweltering night at Ted Carlson Memorial Stadium in Rockford on Friday, September 22nd. The start of the game was pushed back from its normal 7:00 P.M. beginning by 30 minutes in an effort to alleviate the unseasonably hot and humid weather. The heat did little to affect the turnout however as the Rockford side of the field was filled to near capacity. The officials also made several temporary play stoppages in an effort to allow the players to stay hydrated. The decision by Rockford Superintendent Dr. Michael Shibler to move the start time back proved to be a wise decision as temperatures were noticeably cooler as the game progressed then they would have been. As for the game itself, Rockford jumped out to an early lead before stumbling a bit in the second quarter and took a surprisingly narrow 17-3 lead into the locker room at halftime only because Eric Zeboor boomed through a 43-yard field goal at the halftime horn. But the Rams were firmly in control throughout despite the occasional glitches in execution. It actually looked like the Bucs may get on the board first as they lined up to attempt a 40-yard field goal midway through the first quarter. But Chase Novak and the Rockford defense had other plans as Novak burst off the left side to cleanly block the attempt. And to make matters worse for Grand Haven, Alex Miller scooped up the ball at the Ram 27 and proceeded to run the length of the field while just avoiding a desperation lunge to make it 7-0 Rockford at the 6:25 mark of the opening quarter following Zeboor’s conversion. Grand Haven succeeded in making a 41-yard field goal to make it 7-3 on their next possession with 4:19 left in the opening stanza. But the Rams had a quick retort. After starting from their own 20 it took Rockford only seven plays to traverse the field and add to their lead. The scoring play was a 12-yard burst from Maliq Thompson on a sweep right that saw him cut up field and break a tackle to make it a 14-3 game (following Zeboor’s PAT) with 2:00 still to play in the first quarter. 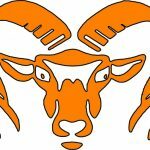 Paul Reinke came up with a fumble recovery for Rockford in short order but the Rams were unable to capitalize and increase their lead. Grand Haven actually got to the Rockford 40 on their next possession before failing on a fourth down attempt at that juncture. Khale Showers came up with the big hit for the Rams to deny that foray into Rockford territory. Zeboor’s boot ended the scoring for both teams going into the half. Thompson got his second TD of the night midway through the third quarter to make it 24-3 Rockford. This time it was a 17-yard jaunt around the right side as the speedy senior went in untouched for the score. But the Bucs answered quickly with a 50-yard TD pass of their own to make it a 24-10 game. That play unnerved the home crowd for just an instant but the reply from the Rams took less than three minutes. The Ram drive got underway as Jake McLean returned the kickoff from the starburst formation out to the Rockford 45. From there it was only a seven play drive to the end zone. The highlight of the drive was a 34-yard run from Connor White that got the ball down to the Grand Haven one. Jack Richardson went the final yard to give Rockford their fourth TD of the night and increase the lead to 30-10. 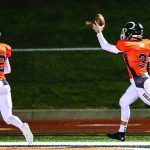 Rockford used a gimmick play on the conversion as Eli Haddad took the shotgun snap and rolled left before pitching the ball late to Zeboor who coasted in for the conversion to make it 32-10 with 48 seconds left in the third quarter. Thompson finished the hat trick with his third touchdown of the night to make it 39-10 on Rockford’s first possession of the final quarter. Taylor Green added a fumble recovery for Rockford later but the Rams called off the dogs at that point and the game ended up with the 39-10 final. 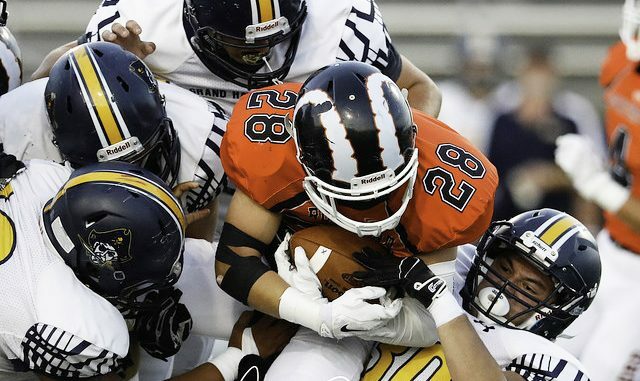 Thompson led Rockford on the ground with 109 yards on ten attempts. He was followed closely by Richardson with 91 yards on 16 carries while White added 49 on 9 carries. Drew Bareno was 7 for 14 passing for 72 yards for Rockford. His seven completions went to seven different receivers. Showers again led the way for Rockford defensively with 15 tackles while Reinke chipped in with eight as well as the fumble recovery. The Rams now prepare for their biggest contest of the season to this point on Friday, September 29th. Rockford will journey to Grandville to square off with the Bulldogs who are tied with West Ottawa atop the OK Red at 3-0. Rockford sits at 2-0 and a win will go a long way towards procuring their ninth consecutive OK Red title.